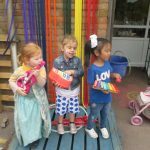 Nursery News – One Week To Go! Our penultimate week and what a week it has been! Nursery have enjoyed their transition days at St Joseph’s and their new schools. Those children joining us at St Joseph’s in September also met their ‘soon-to-be Year 6’ buddies. Mr Gallagher and I met last week and decided to let both classes meet and mix. We wanted the ‘buddy-connections’ to be organic and let them almost find their own matches! This actually worked very well and after only a short while each child had ‘claimed’ a buddy. 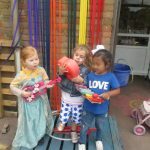 It was really wonderful to see both classes mixing, playing and talking to each other. I am so proud of how confident my Nursery children have become. All of the children seem very happy with the buddies chosen and I know the ‘buddy system’ will be such a positive and wonderful experience for both classes. This has been another very busy week in Nursery and we all took part in the World Cup antics on Wednesday. 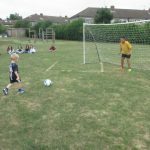 Every single one of the Nursery children scored a goal (if only they had been helping out in Russia!). 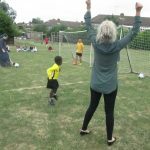 Mrs Gilliam and I also managed to score a goal and I think the children were suitably impressed with my celebration dance, although Year 6 didn’t seem to think much of it! Today was French Day and we recapped the French words we had learnt during International Day. We also enjoyed a drink and a croissant with our buddies on the field, which was lots of fun! Have a fantastic weekend as we head towards our final week before the Summer holidays (where has this year gone?!). This entry was posted in General News, Nursery. Bookmark the permalink.